Pura D'or Argan Oil Reviews - Is it a Scam or Legit? Pura D’or offers organic beauty solutions that promise a chemical-free alternative for those suffering hair loss, dandruff, or acne-prone and troubled skin. Pura D’or claims to be a brand with a mission: to create organic personal care solutions that work naturally. Pura D’or promises that their skin care products are artisanally created by hand, not by machines, with over 95% of their ingredients meeting USDA Certified Organic standards. Pura D’or acknowledges that their premium products are not the least expensive option for those seeking to experience the benefits of argan oil. Including only the highest-quality natural ingredients, the brand’s chemical-free treatments are also certified by the CCOF, Soil Association Organic, and the Canada Organic Regime. Additionally, Pura D’or products are never tested on animals. Pura D’or Pure and Organic Argan Oil can be used from head to toe. Pura D’or claims that the oil is good to moisturize nails, calm frizzy hair, and help rejuvenate skin. Cold-pressed, unrefined, and with no added chemicals, Pura D’or’s 100% argan oil is regularly sold for $48.00 but is currently listed at the sales price of $24.99. Using nutrients like vitamin E and biotin, Pura D’or’s Nail Therapy promises to strengthen nails and cuticles, leaving you with noticeably shinier, whiter, and healthier results within five days. Nail Therapy is regularly sold for $45.00 but is currently listed at the sales price of $24.99. The cornerstone of Pura D’or’s product line is their natural, anti-hair loss shampoos. Pura D’or claims that their hair loss shampoos target the leading causes of hair loss with a DHT (Dihydrotestosterone)-blocking blend. Gold Label Organic Argan Oil Based Anti-Hair Loss Shampoo - $35.99 (reg. $49.00) Anti-hair loss formula adds volume and thickness. Contains 15 DHT blockers. Certified USDA Biobased product. 100% Natural preservative. Suggested use includes leaving on for two minutes for maximum penetration. Results after 90 days. Premium Organic Argan Oil Based Hair Loss Prevention Therapy Shampoo - $24.99 (reg. $37.00) Anti-hair loss formula adds volume and thickness. Contains 12 DHT blockers. 99% natural preservative. Suggested use includes leaving on for two minutes for maximum penetration. Results after 90 days. Premium Organic Argan Oil Based Scalp & Dandruff Shampoo - $24.99 (reg. $37.00) Helps control flaking, scaling and itching scalp caused by dandruff using natural extracts. Suggested use includes leaving on for two minutes for maximum penetration. Premium Organic Argan Oil Based Tranquility Shampoo - $24.99 (reg. $28.00) Hair-strengthening shampoo adds body and shine. Gentle and organic formula enriched with essential oils. Pura D’or claims that their natural skin care products are hypoallergenic and safe for all skin types. Despite being oily in nature, Pura D’or suggests that their skin care products assist even acne-prone skin with supplements that act as a natural barrier. Professional Strength 20% Vitamin C Serum - $24.99 (reg. 59.00) This anti-aging serum includes 20% vitamin C. Pura D’or claims that it helps to increase skin’s elasticity and firmness, while offering protection from antioxidants. It can be used morning and night, though extra care should be taken around the eye area. Organic Rosehip Seed Oil - $24.99 (reg. 59.00) Enriched with essential fatty acids (Omega 3, 6, 9), as well as containing immense amounts of Natural Retinol Acid (vitamin A) and vitamin C, Pura D’or claims this product helps to regenerate skin cells and stimulate collagen. Can be applied as needed. Organic Anti-Aging Face Cream - $39.99 (reg. $89.00) Pura D’or claims this anti-aging cream dramatically improves the look of wrinkles, sagging, and dullness without the use of chemicals. It is approved for use in products certified by the Natural Products Association (NPA) and NSF that are made with the "organic" standard. Repeat every morning or night as needed. Scar Treatment Solution - $24.99 (reg. $45.00) Pura D’or claims that this product can be applied to scar tissue to help the damaged skin become less noticeable. It can also be applied directly to cuts and scrapes, to calm wounds and add protection against infection. Safe for daily use. Acne Treatment Solution - $24.99 (reg. $45.00) Pura D’or claims that regular use of their argan oil acne treatment helps to maintain the balance of sebum production and lessens the risk of breakouts and blemishes. Suggested use is 2-3 drops twice daily after washing face. What’s Inside Pura D’or All-Natural Products? Do all these natural ingredients really work or is Pura D’or selling snake oil? “The marketing is still ahead of the science for the most part, but there is enough published work to convince me that the antioxidant botanicals will be the next big thing in skin care," says Richard Baxter, MD, faculty member at the University of Washington School of Medicine and chief medical officer of Calidora Skin Clinics, in an interview with WebMD writers. For instance, Argan oil may improve skin ailments such as eczema, psoriasis, wrinkles, and dry skin and soy can help prevent pigmentation. So, what else is inside Pura D’or products? You can view a complete list of ingredients on each product page (for example, here’s their hair loss prevention shampoo) or an overview of their most popular herbs here. Tea tree oil is usually valued for its anti-microbial, anti-inflammatory and nice smelling qualities. No major adverse effects. Black seed oil has been used for thousands of years (since ancient Egypt) for about a zillion things. The only known side effect noted includes possibly interfering with uterine contractions — so avoid it if you're planning on giving birth. It’s unclear if the warning applies to topical use but, hey, better safe than sorry. Amla oil is another popular healing herb for use in shampoos and is believed to prevent the premature graying of hair, but there isn’t any conclusive proof. According to Examine.com, nettle extract may have some anti-inflammatory effects and improve urinary flow in men with BPH, although there’s limited clinical evidence that it can reliably provide other benefits in humans. Biotin, which is a darling of the supplement industry and found in many cosmetics products. It's necessary for hair growth but is mostly produced by bacteria in your gut. That means even in large amounts, Biotin isn’t toxic because it's water soluble and easily passed through the body. However, super-dosing on biotin won't give you a glorious lion mane and the supplement is pretty much useless unless you’re deficient due to wicked-strong antibiotics. However, lots of companies still include this anyway because, well, marketing. Saw palmetto appears to be our other active ingredient. With a mechanism similar to nettle extract, it might inhibit hair loss. But that's only a might. Cedarwood oil is a preservative and smells nice. Nothing to see here. Rosemary and sage are probably in there for the same reasons. He sho wu is from traditional Chinese medicine. It might promote hair growth, but it's still being studied. It definitely can cause liver damage. Hibiscus is thought to prevent hair loss according to Ayurvedic medicine. There isn’t any real proof or side effects. Pygeum, commonly sold as a supplement for prostate health, looks to be our third active ingredient. It does about the same thing as nettle and saw palmetto and doesn't look to have any associated side effects. Keep in mind that while some of these ingredients have reported benefits, Pura D’or products may not contain enough of each to make a difference. Turns out a drop or two of most essential oils or essences doesn’t really affect anything more than a product’s marketing. Shoppers considering a Pura D’or purchase will be pleased to learn that the company doesn’t attach any strings to your order — there are no hidden subscription sign ups or recurring fees. Pura D’or does offer free shipping on all orders within the continental U.S. (sorry Alaska and Hawaii), $29.99 for shipping to Canada and $49.99 for international orders — which seems quite steep! Additionally, U.S. shoppers are allowed a “next day” shipping option for $29.99. Every Pura D’or order is backed by a 100-Day Complete Satisfaction Guarantee, allowing a no-questions-asked return if you’re not pleased with your products. Pura D’or will subtract the cost of shipping and handling, and may require you to return your products before issuing a refund. This is where it gets tricky: looking at Pura D’or’s Press page or searching elsewhere online for reviews, you’d think they’d gotten lots of coverage! However, those “In the News” magazine features don’t link out. And if you look at any of the featured articles? Turns out Pura D’or isn’t being reviewed — they simply included some products in the 2015 Oscar giveaway bag for the press. Additionally, nearly every blog reviewing Pura D’or products states an affiliation or that products were sent gratis for review. While honest bloggers mention this in the fine print, many do not. Additionally, Amazon ratings are high — a solid 4.5 stars from over 3,500 orders. However, in our opinion many of those top reviews are suspect. A disproportionate percentage of the five-star reviews were left in October and November of 2014, many of which have very similar language and were left by accounts with no previous review history. The hair loss-prevention shampoos don’t lather particularly well and may leave hair feeling mildly unclean. Those using the hair loss-prevention shampoos did notice a decrease in fallout. The pure argan oil hasn’t irritated sensitive skin or caused breakouts. The conditioner is widely reviewed as having an AMAZING scent. Unlike many brands we see on Highya, Pura D’or appears to validate their claims of eco-conscious, organic ingredients with government approved certifications. Those certifications provide assurance of Pura D’or manufacturing standards, but suspicious Amazon reviews leave us less convinced of their ethics — is Pura D’or’s feel-good messaging just good marketing? Most importantly, will Pura D’or products work for you? Everyone’s body chemistry is different, so it’s impossible to make an authoritative statement that their products will or won’t suit any individual. However, Pura D’or does offer a wide range of natural cosmetics formulated to assist with different skin and hair ailments. Additionally, their ingredients and formulations do appear to provide a chemical-free alternative for those who’s skin, hair or nails are in need of a little boost. Thankfully, with their money-back guarantee and lack of a strings-attached ordering system make trying out their products relatively risk-free. A friend recommended this shampoo. I used to use Argan Oil shampoo before, but thought of trying this. Please keep your money, it is not worth at all, it doesn't do anything good. I wouldn't recommend this shampoo to anyone, it's a scam and not true of what it saying on the bottle print. I was very disappointed with this shampoo. It left my very fine delicate hair feeling dry, brittle, and wiry. The conditioner wasn't much better. I am not happy that I spent $40.00 on this! 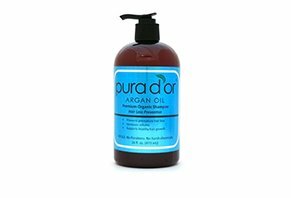 I started using Pura D'or Argan Oil hair products for hair loss. I've used the gold and blue-labeled products. Both are good, but I think that the gold makes my hair stronger. Unlike the above reviews, my hair color actually stays longer, and also it seemed that my hair grays less. I used to color it every 4-5 weeks, and now I touch up at 6-7 weeks. I've recently used the scalp shampoo, and my dermatologist commented a few weeks later that I have a lot of new baby hairs. I highly recommend Pura D'or. I am an honest reviewer and a self-paying customer. Tried the shampoo and conditioner to help with post menopausal thinning. Agree with the reviewer who says it left her hair feel like wire, or straw. My biggest issue is that it really, I mean really, strips my hair color. I didn't think a shampoo with all natural ingredients would do that. Pretty disappointing in all. Been on Finasteride for 5 years and I started recently noticing a lot of thinning toward the front of my scalp. I decided to try some topical products to go with my generic propecia (which is super cheap now since the patent is up and you can get real generics). I bought this shampoo and conditioner and a bottle of Lipogaine. I started using them at the same time so I can't say for sure what works, but the combination of everything works. After one week of adding these products to my regime, my hair stopped shedding in the shower. After a few weeks, new hair started to grow. A few weeks more those hairs were grown and more short ones started growing. Excited to see were this all leads, hope this helps and good luck. It was ok. After finishing one bottle, looking for another shampoo. Pura D'or is a very mild shampoo and that can be good. To give you an example of its mildness, I leave a day in between washes, my scalp gets much oilier, compared to how it gets with a regular shampoo (i.e. Dove, Pantene, etc.). It has to have a lot of botanical extracts because it smells like crushed herbs. I feel like I am doing something good to the planet because it does not have harmful chemicals. However, the main purpose of my purchasing it was to reduce the amount of hair loss. And I don't think it has made any difference. So, I am looking for alternatives. This shampoo makes my hair feel like wire. I use their conditioner as well and still can't get a comb through it. Their customer service is unresponsive. My hair looks drier and thinner. Pulls out when I comb it. This is a super expensive SCAM! Write a Review for Pura D'or Argan Oil!